The River's End park is the only campground on Tybee Island. It is located 3 short blocks from the beach and 2 blocks from the historic Tybee Island Lighthouse. From here, you can take a leisurely walk to the beach to hunt for seashells or just explore the area. River's End is also the closest RV park to Savannah's historic district. The park is well-shaded with large moss-draped oaks. A section in the rear of the park had a very shaded area, with flowers blooming all around. 50 gravel campsites are available with 24 pull-thrus and 15 tent sites. The sites are a little on the small side, with the average site being 20 x 40. Cable TV is available, as well as wireless Internet. The campground includes a seasonal swimming pool for guests, which was open during our visit in May 2000. Facilities include showers, a dump station, public phone, laundry, some RV supplies, and LP gas is available. Park model RVs are available for sale for an inexpensive home near the beach. 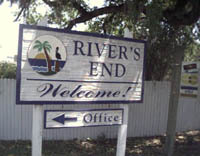 River's End is located at 915 Polk Street in Tybee Island, Georgia. 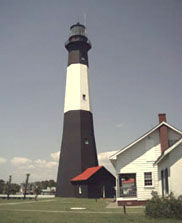 It is located just 2 blocks from the historic Tybee Island Lighthouse and Museum. From the junction of I-95 and I-16 (exit 99A), go east 8 1/2 miles on I-16 to Martin Luther King(exit 167), go north 7/10ths of a mile to Bay St. (becomes President and then Island Expressway), go east 6.3 miles to US-80, then east 9.9 miles to Polk then north 2/10ths of a mile on Polk.